Starting Your Business: Sat. 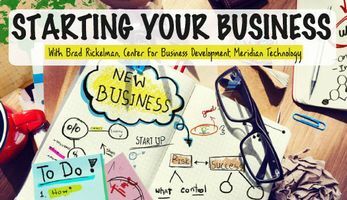 Oct. 13 from 10am-12pm Presented by Brad Rickelman from Meridian Technology’s Center for Business Development. This free class will teach you how to develop the right market, create financial estimates, avoid common pitfalls, and more. Please register at www.tinyurl.com/MeridianBusiness or call the Help Desk at (405) 372-3633 x8106.